Teaching and learning can occur in varied locations. Last weekend Carol and I made the annual Memorial Day visit to family cemeteries with my sister Pat, her husband Skip and their grandson Nick. One of the values of this trip is that family stories are told and added to by the other family members, resulting in a more filled out oral history that becomes shared and hopefully remembered and passed on to other family members. This blog entry will be my thoughts and the memories evoked during the trip. The Odd Fellows’ cemetery in Shenandoah is the location of our grandparents and great grandparents’ grave sites. Our grandfather grew up in the house (pictured) located at the gated entrance to this cemetery. Sounds like a strange place to grow up, but it happened this way because our great grandfather, William, was the sculptor/mason who crafted the grave stones there. Family history says that he died of white lung disease, a result of his sculpting. 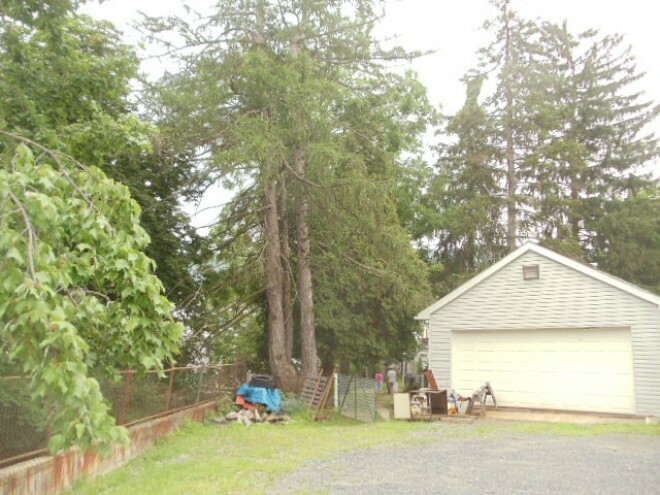 His gravesite (pictured) was repaired by Skip, Pat and Nick because over the years in had eroded and was tilting over. They really did a great repair job as you can see in the photo. 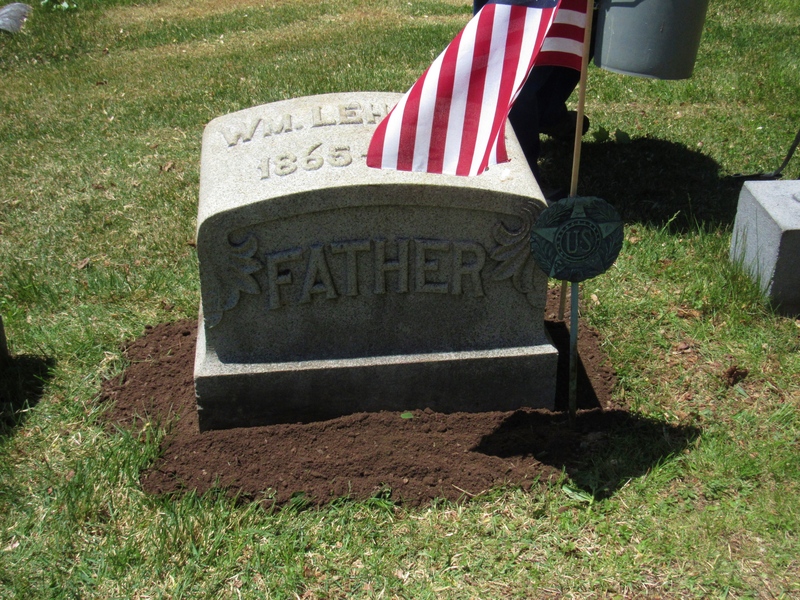 A question arose as we looked at the veteran’s flag that is placed on his grave every year. He was born in 1865 (too young for the Civil War) and died in 1918 (too old for WWI). Did he serve in a conflict, did he enlist because he saw the military as an opportunity, or has a mistake been made with the flag? This is a question I will pursue. 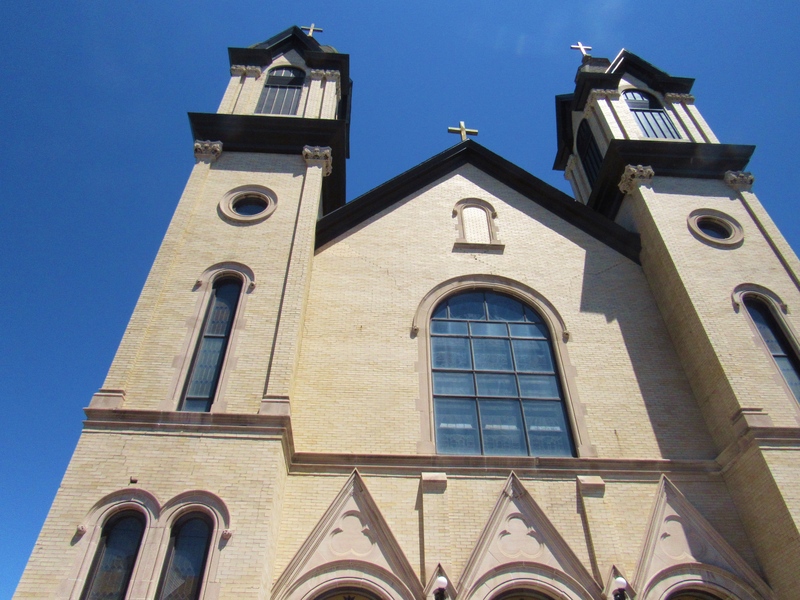 William also sculpted icons for local Catholic churches. I recall a trip with my grandfather when he pointed out some of the sculptures his father had created. The church (pictured) was the only church I could remember and you can see that the windows have all been replaced. In their place there used to be small alcoves with the sculptures embedded in them. We wondered if they were now inside the church. If there had been a priest’s home nearby I would have knocked and asked about them. There were none and I wonder if a Quaker/Agnostic’s inquiries would have been welcomed anyway. As we drove around Shenandoah I remember thinking as a child that this was a city. It isn’t! It is a small coal town – now in bad disrepair, filled with worn down houses and streets with potholes everywhere. 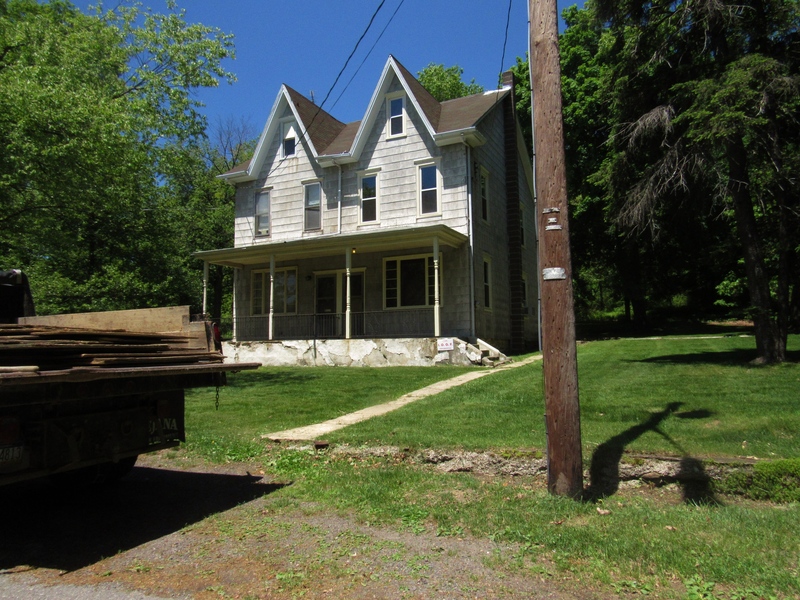 Our next cemetery visit would be in Tremont, with a detour through Pottsville and the raising of more memories. Our list of places to see included Coney Island (pictured). This is a place that our father loved! The original Coney Island was downtown but that is no longer there. This is not food that one would normally travel miles to eat, but, for me at least, it is one of those places. 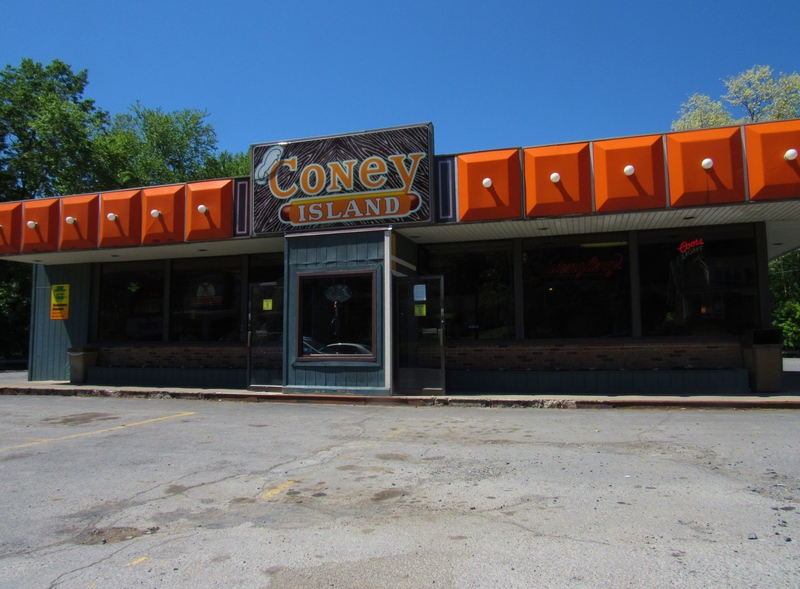 Coney Burgers and Coney Dogs – nothing like them anywhere! As we traveled up Market St. We passed an empty shop that used to be the Sugar Bowl. Our family often ate there on shopping trips to the big city of Pottsville. 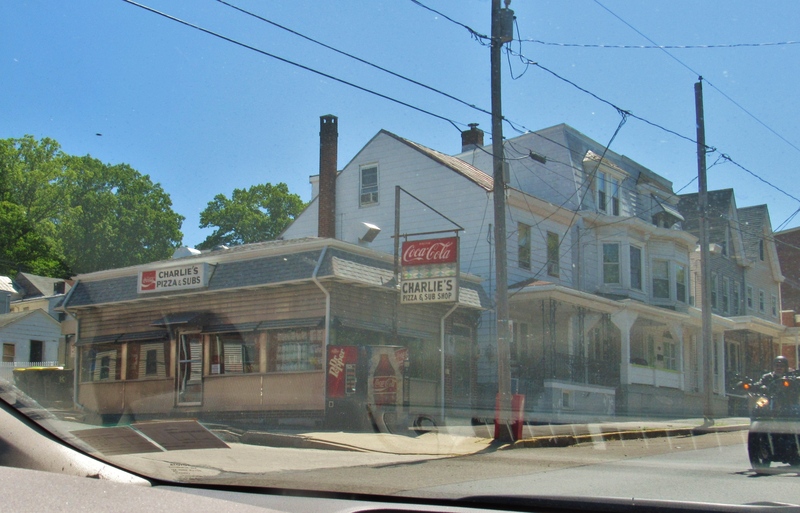 We also passed Charlie’s Sub Shop (pictured) – still there! This was the first place that I remember ordering a turkey hoagie. I had never heard of them before! 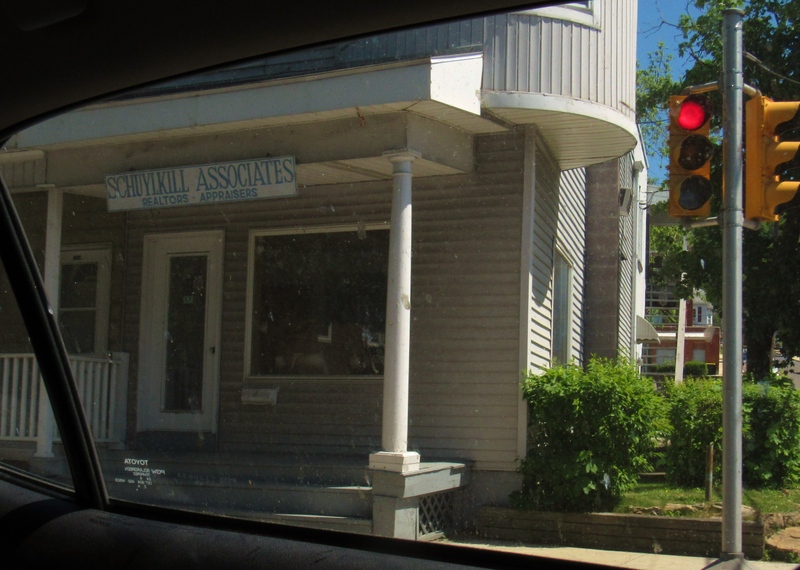 After that we passed a building that housed The Danish Bakery (pictured) – now a realtor’s office. The Bakery was owned by two women who made great cookies and pastries – and the best cream puffs in the known world – at least the world as I knew it at the time. Near Coney Island we saw a grocery store. Years ago it was an Acme – one of the first supermarkets to open in the area. I can still recall my father going down the aisles and picking out fresh and frozen prepared foods. He was a sucker for those kinds of things. I recall my mother just looking at him as though he was a kid in a candy store, and I guess he was that for a few minutes. 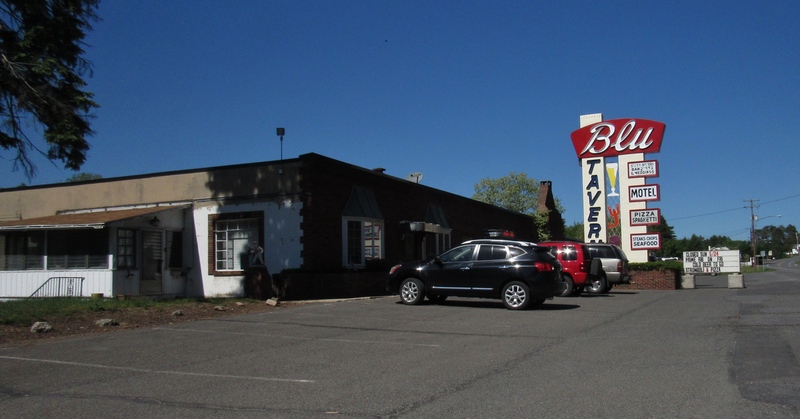 On the way to Tremont we passed the Blu Tavern (pictured) – it is also still there. There were always stories about how our parent s would go there for dinner and dancing. A little further down the road used to be a restaurant called Chance’s. That is no longer in operation, but we used to visit there for dinners of clams and shrimp. We eventually made it to Tremont and the cemeteries where our parents, many friends and relatives’ grave sites are to be found. I have written about some of them in earlier blog entries and will write more about some of these people and memories that their names evoke. This entry was posted in Family Stories, Oral Histories and tagged family stories, Memorial Day memories, oral histories. Bookmark the permalink. Great blog. I have a blast remembering things in the past!